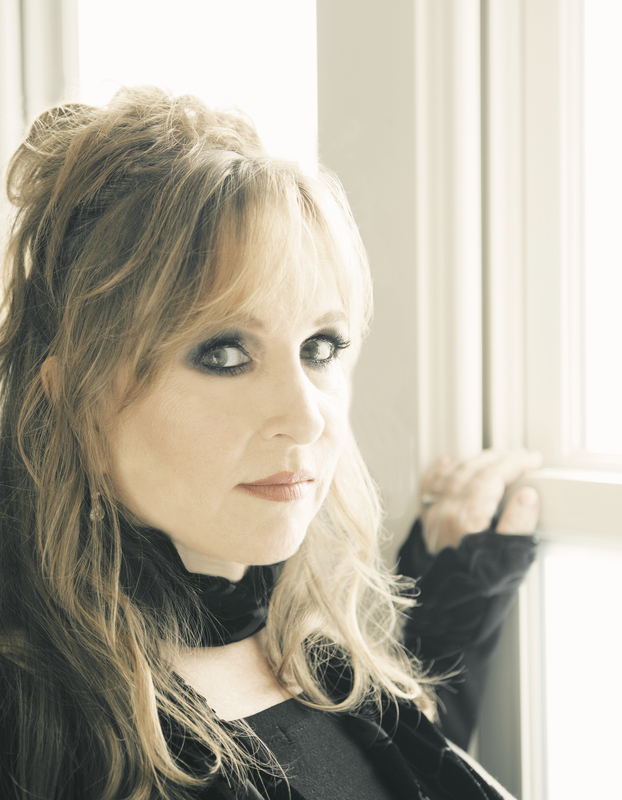 Gretchen Peters knows how to make you feel at home when you’re calling, in my case quickly dispelling my glamorous image of her adopted hometown, suggesting Nashville’s like any other city I might know. The Tennessee state capital is her nerve centre, but don’t get the wrong impression. We’re not talking Stetsons, cowboy boots and redneck country. Come to think of it, that’s probably more my perception than yours anyway. I always had a distrust of country, put off by the Grand Ole Opry, lingering notions of the Marlboro Man, and that bar in The Blues Brothers where they play both kinds of music – country and western. For me it took Emmylou Harris’ winning 1995 Daniel Lanois-produced LP, Wrecking Ball, to realise there was plenty of good country around. That was my gateway album, this elder stateswoman of country on top form amid guest collaborations from the likes of Neil Young, Steve Earle, the McGarrigle sisters, and Lucinda Williams. And she was a profound influence on Gretchen, a decade younger and still finding her feet in the recording world at the time. The following year she recorded her debut LP, The Secret of Life, including contributions from Ms Harris, Mr Earle, and the man who later became her husband, keyboard player Barry Walsh. 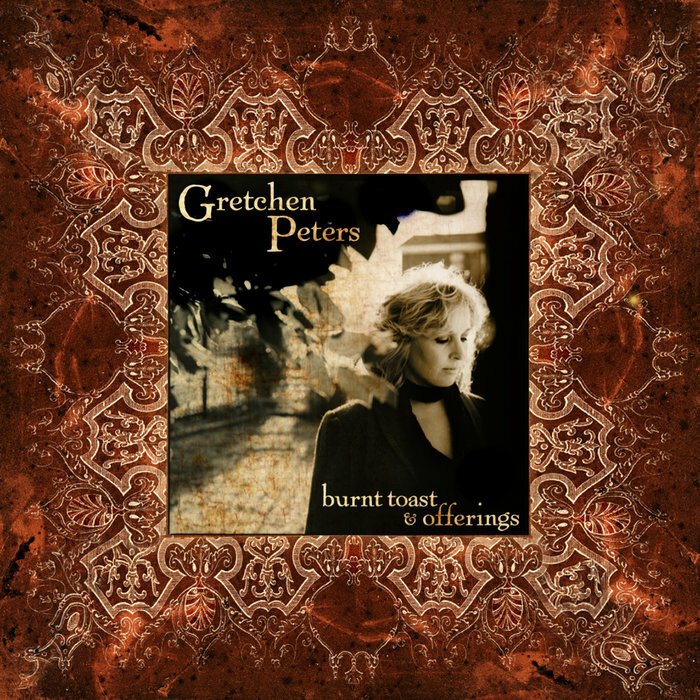 Yet while that record was well thought of, she reckons her turning point came a decade later with her Burnt Toast and Offerings LP. 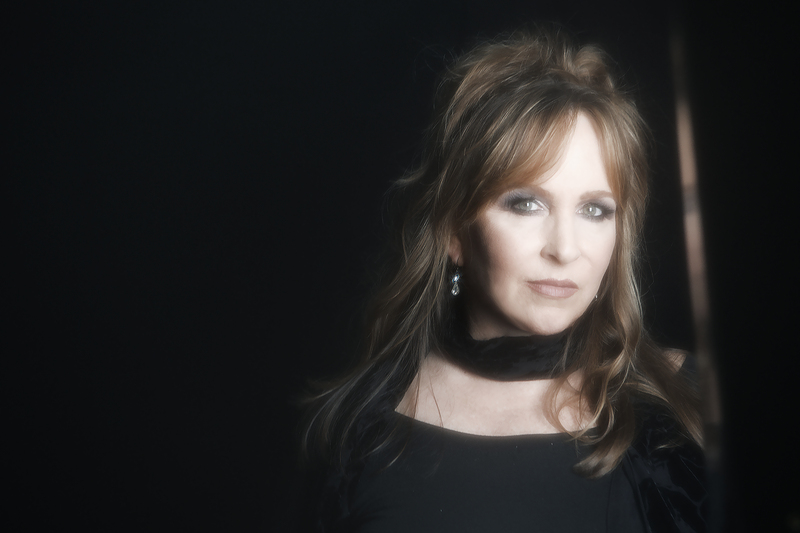 Born in Bronxville, New York, and raised in Boulder, Colorado, Gretchen re-settled in Nashville in the late ‘80s, composing hits for Bryan Adams, Neil Diamond, Etta James, Shania Twain, and Trisha Yearwood, among others. She was soon making her own records too, her reputation slowly growing via high-profile covers from the likes of Faith Hill and Martina McBride, Gretchen finally inducted to Nashville’s Songwriters Hall of Fame in 2014. If 2015 album Blackbirds saw her reputation grow all the more outside America, she’s now proved that career high was no one-off on the strength of powerful new offering, Dancing with the Beast. So where does she tend to work these days – at home or in the studio? “I work in the studio in spurts. If I’m on a recording project, I’m living there. But I go long periods without being in the studio. It’s one of my favourite places to be though. I feel there’s something magic about it. The world kind of melts away and you’re just in this little space making stuff with your friends. Have you got dates lined up stateside before leaving for the UK? That UK agenda starts with a date in Stamford Corn Exchange on May 19th, her itinerary including a return to my North-West patch for dates at The Atkinson in Southport (May 26th), and the Royal Northern College of Music, Manchester (May 27th) en route to a tour finale at London’s Cadogan Hall on June 13th. And as it turns out, my Queen of Country Noir has been lined up for a few festival dates too, including ones in Beverley (June 15), Wadebridge and Shrewsbury in late August, plus three Irish dates in early September. By all means. I did mention a similar handle on the strength of your last album, and now have no doubt as to your elevation to regal status. 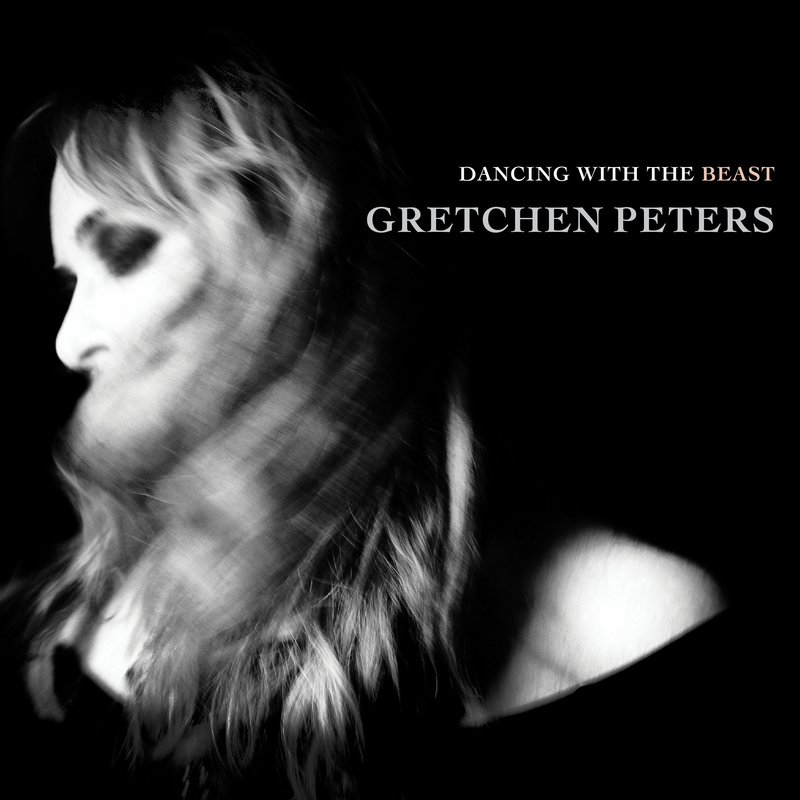 When I caught up with Gretchen, I was barely two listens into Dancing with the Beast, driving around with it playing in my car, but already hooked. And subsequent plays have only made me love it all the more. She’s on great form again, I venture. While there was no need to prove yourself, this latest record suggests you’ve retained that high ground reached by Blackbirds. I got the feeling your Blackbirds period marked recognition for a self-confessed late bloomer as a leading artist, and this LP suggests you remain there, the songs seemingly effortlessly good. “Well, thank you for that, but they’re definitely not effortless! Nothing in the realm of writing for me has ever been effortless. I work really hard at it. But it’s a double-edge sword having success. Blackbirds felt like a big step forward. But having that kind of success did give me a sense of confidence, I guess, about what I’ve been doing for the last 20 years. Three years ago, you mentioned to me how Burnt Toast and Offerings was a career turning point. Somehow that’s 11 years ago, to me suggesting you’ve been on that higher creative plane more than a decade now, hard as it must have been at times to keep up that heavy touring profile. “Wow, 11 years ago? I quite agree with that though. I felt like I had a fire inside of me from that album on – to do better and better work and be a more and more honest and vulnerable in my songwriting, and to dig deeper, I guess. “I look back at that 11-year period and it makes me a little dizzy, because there’s so much touring and so much work involved. But one of the things that my husband – my now-husband, because he wasn’t my husband at the time – said to me around that time when we made that album was that the way you get better is by doing it over and over and over again. We’ve talked about Emmylou Harris’s influence before, and and there seem to be similar production qualities on this album to her Wrecking Ball outing with Daniel Lanois, thanks to yourself, the hubby, and Doug Lancio (who Gretchen has worked with since that Burnt Toast and Offerings LP). “Yes, I think so. The thing I instinctively knew about Doug was that he’d push me slightly past my comfort zone. He does that, and continues to do that, and that’s why I love working with him. I know I need that and know it’s a very strong element of the production team Doug and Barry and I have put together. And Doug’s kind of a ‘vibe whisperer’ … much in the same way as Daniel Lanois, although I’ve never worked with him before in the studio. I guess what made me think of Daniel Lanois was the slow-build qualities of songs like the title track, Dancing with the Beast, and Lowlands, both of which have a kind of U2 feel. I could hear Bono tackle them. For some, an out-and-out attack on the Trumps of this world would work, but the power in your work is in that more intricate attention to detail, on Lowlands and elsewhere, be it addressing disrespect of the individual, objectification of women, casual racism, any of that. And as things stand politically, perhaps it’s all the more important for someone with your strong character and sense of right and wrong to come over here and remind the world that the fella with the orange day-glo tan doesn’t represent the America we felt we knew and loved. “I feel strongly about trying to impart that message. I know people in the UK know he doesn’t represent all of us, or even most of us, but after what happened in 2016 I just feel it’s not possible or not morally right to remain silent. Strong women are at the heart of this record, little vignettes of other people’s lives written so believably. Has that always been your stance, or are you getting more radical as the years pass, forced into confronting it all? “Ha! Well, they say you either get more radical or you get more conservative. something’s gonna happen! I wasn’t so much radicalised as I was energised by what happened in the election, and as far as the women characters go, my approach to writing has never really changed. “I listen for characters, I listen for voices, I listen for titles, and the voices that were the loudest in my head when I was writing these songs were these girls and women, so those were the stories I chose to write. But when I look back on it, I’ve been doing that for 25 to 30 years, going back to Independence Day and probably going back further. Of course, none of the above would be worth listening to unless you knew how to write a great lyric and a cracking song too, and the imagery on this record is so sharp, from Arguing with Ghosts right through, not least on Wichita and Truckstop Angel. You have a skill for writing tales so personally. Is there a lot of you in the characters you sing about? Or are you just a seasoned people-watcher? “I’ve thought a lot about this, and I think there’s more of me than I even want. But what it really boils down to and what I’m always trying to do is to find the empathy. If I’m writing a song, I have to find the empathy I have with that character. You told me last time we spoke how much you enjoyed writing songs with Ben Glover, and he features a lot on this album too. There’s Matraca Berg too. Any closer to that dream duets album we’ve talked about before now? On the last album we had the wondrous Nashville, you covering David Mead’s song, with him guesting, and this time you’re back on the theme of your adopted hometown with Matraca and Ben, telling us you’re not quite recognising what they’re doing to the place on lead track, Arguing With Ghosts. “That’s how that song started. Matraca is a Nashville native – and they’re very rare here. We were talking about how Nashville’s changed and she literally said, ‘I get lost in my hometown,’ and we all looked at each other and knew we had our opening line. Speaking of Nashville, last time we spoke I hadn’t realised an indirect link, an old friend from my South of England hometown, talented ex-Ben Folds, Supermodel, Deep Season and Jim Jiminee drummer Lindsay Jamieson, based there quite some time now and in a band called Elle Macho with a certain David Mead. I get the impression from what you’ve spoken about so far regarding this album, that it came out of a hard place, and not just because of the current political landscape, but for personal reasons too, following a difficult period in your life. Is this the power of music as therapy? “I think it is, but I don’t really want to reduce it to therapy. If it were just therapy, everyone would … From my own point of view, I was taking a year off which didn’t turn out to look anything like the year off I pictured in my head. I was picturing restoration, rest, sitting in a lotus position, and instead the election happened and I lost my mum about a month after that, then I lost two very dear friends, one of them being Jimmy LaFave. I know I was feeling that while listening to the album on my way back up the motorway after my Mum’s funeral, most startlingly on Love That Makes a Cup of Tea, some of the words almost echoing the eulogy I wrote about her. That song’s clearly extremely personal to you, but translates perfectly to me and no doubt many others. “Oh, well I’m so sorry to hear about that, but at the same time I’m so glad that song affected you that way, because – as you say – it was very personal to me. It’s a perfect way to end the album. A little light at the end of the tunnel, you could say. And I guess there will always be those highs again if we can learn from the lows, right? Meanwhile, I understand that as well as truly appreciating the power of a good song, you’re a fan of the whole package, not least a continuing love for the vinyl long player. 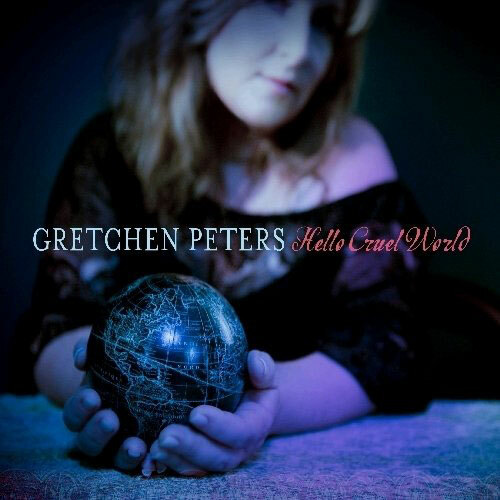 For a link back to Gretchen Peters’ last writewyattuk interview, from February 2015, head here. 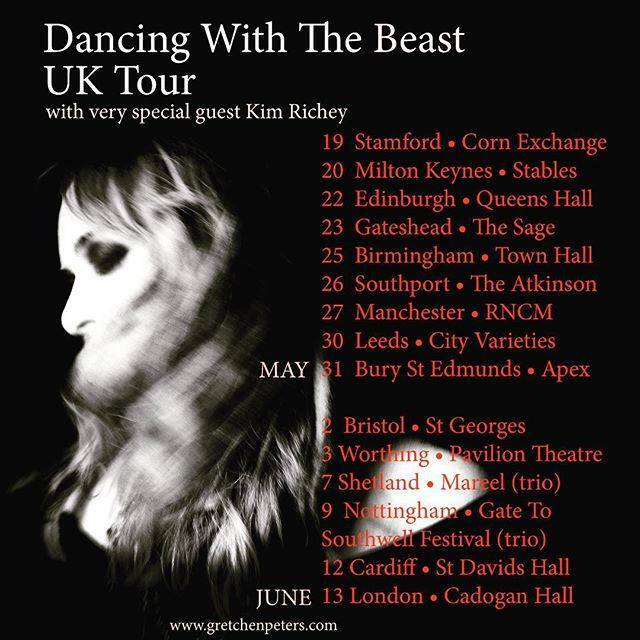 To snap up tickets for Gretchen’s 2018 UK tour, with support from Kim Richey, and various festival dates, try this Facebook link. You can also keep in touch via Twitter. And to pre-order Dancing with the Beast, out on May 18th, visit this Proper Records link. 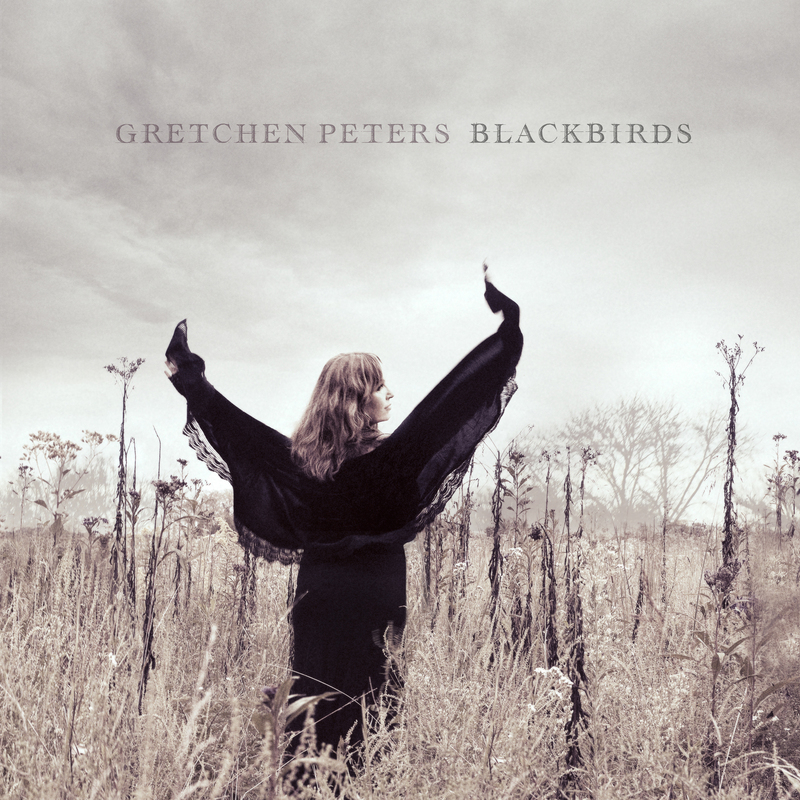 In 2015, I reviewed Gretchen’s Blackbirds album for this site, but this time happened to chance upon an album review by my friend Niall Brannigan for The Afterword, and felt he said much of what I wanted to add. Follow this link to find his online take on Dancing with the Beast. This entry was posted in Books Films, TV & Radio, Music and tagged Arguing with Ghosts, Barry Walsh, Ben Glover, Blackbirds, Dancing with the Beast, Daniel Lanois, David Mead, Doug Lancio, Emmylou Harris, Gretchen Peters, Matraca Berg, Nashville, Steve Earle, vinyl, Wrecking Ball. Bookmark the permalink.